(TibetanReview.net, Nov20, 2018) – President Lobsang Sangay of the Central Tibetan Administration at Dharamshala, India, has on Nov 17 joined some 300 leaders from some 90 countries at an annual 3-day international security forum held at Halifax in Nova Scotia, one of eastern Canada’s Maritime provinces on the Atlantic. 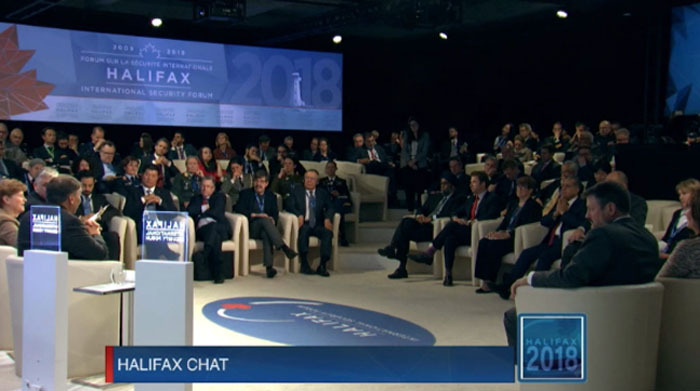 The theme of the discussions at the 2018 Halifax International Security Forum was China and Russia’s challenge to the liberal democratic values underpinning the international order. Notable participants at this year’s gathering were stated to include US Chairman of the Joint Chiefs of Staff, General Joseph F Dunford, Jr; Canada’s Minister of National Defence, Harjit Singh Sajjan; and the Deputy Secretary General of NATO, Ms Rose Goettemoller. Sangay was stated to have spoken at a Dinner Session along with General Micael Bydén, Supreme Commander of the Swedish Armed Forces, and Mrs Cindy McCain, Chair of the McCain Institute for International Leadership. He was stated to have dwelled on democracy being under stress due to increasing Chinese influence around the world, including by its co-opting of ruling elites. He was also stated to have spoken at the plenary session, supporting the role of the NATO Alliance in protecting the liberal democratic order of the world.